First cut a 6" x 9 1/2" piece of Stampin' Up! Melon Mambo card stock and fold it in half for the base, a 4 1/2" x 5 3/4" piece of piece of Stampin' Up! Pool Party for the middle layer and a 4 1/4" x 5 1/2" piece of white for the front layer. Next sponge the front layer with Stampin' Up! So Saffron ink around the area the sun will be, then cut out a circle and attach it with removable adhesive. Next sponge Stampin' Up! Pink Pirouette above the So Saffron, then Stampin' Up! Night of Navy at the top. Next for the ocean sponge Stampin' Up! Pool Party below the So Saffron then Stampin' Up! Crumb Cake at the bottom to create the beach then remove the circle. Next stamp a water texture over the ocean with Stampin' Up! Craft White ink. Then using a stamp positioner stamp the seagulls with the stamp from the Stampin' Up! Wetlands set and the Flamingo's legs with the stamp from Stampin' Up! Flamingo Lingo in Stazon Jet Black ink. 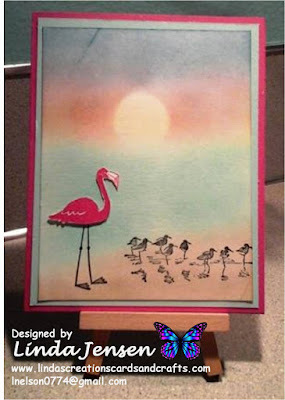 Then stamp the flamingo on a piece of scrap paper in Melon Mambo ink, cut it out and attach it above the legs with a mini pop dot. 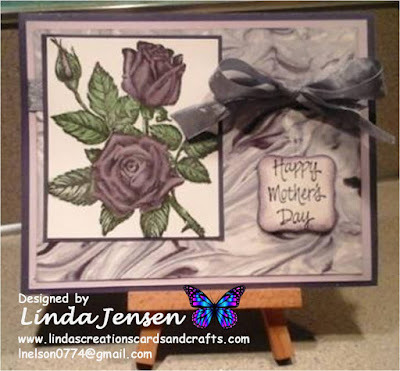 Then finish assembling the card and enjoy!